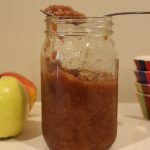 Enjoy the warm spices of this wonderful homemade applesauce. You’re sure to love this recipe since it’s so easy to make and tastes delectable. Serve warm or cold, anyway is the right way! 1.Wash apples, dry, take off peel and cut into small pieces/chunks. 2.Drizzle lemon or orange juice over the apples and toss around with a large spoon. 3.Add cinnamon and spices along with sugar if using, add vanilla extract into water and pour over apples. Toss with a large spoon. 4.Dump apples into crockpot. Turn on high for about 4 hours. You can turn on low and cook about 8 hours. Check after 3 hours. This will depend on how small you cut the apples up. Open up cover after 2 hours to mix. 5.When done, if the apples are still chunky, you can either mash a little with a fork or cook a bit longer. We liked it a bit chunky. 6.Eat the first batch from the crockpot, it’s so delicious over ice cream or just by itself for dessert. Then, place in covered glass container. Keeps for at least one week in fridge. ENJOY!